Get started with sales and customer support on the #1 CRM for $25 a month. You work hard. Meet the customer relationship management solution that works hard for you. 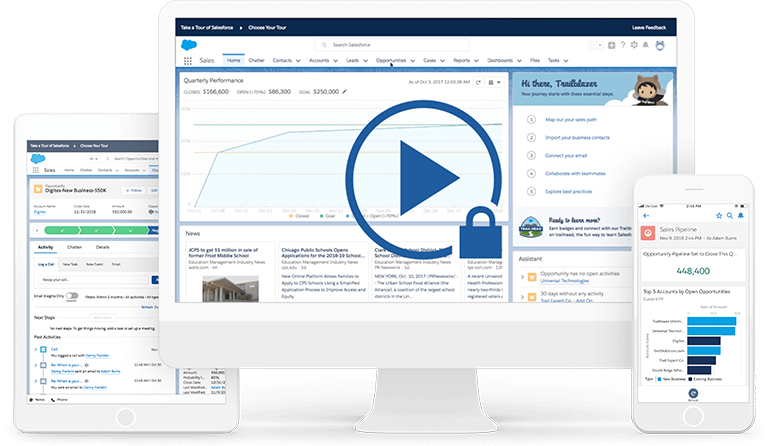 Say hello to Salesforce Essentials. Sales and customer support tools from the #1 CRM, for one simple price. Pay monthly for $30 USD/user/month. * Offer requires an annual contract. Monthly pricing available. Need more than the essentials? Explore our full range of complete customisable CRM products to grow your business. Take a closer look at what CRM is and how it helps find, win, and keep customers. Customers matter. But spreadsheets, emails, and sticky notes are a hard way to manage them. Customer relationship management (CRM) centralises that data so you can manage sales processes, help customers faster, and market smarter. * Source: Salesforce Customer Success Metrics Survey, conducted 2015–2017 among 7,000+ customers randomly selected. Response sizes per question vary. Four more reasons small businesses choose Salesforce on their road to success. World's most trusted solution and #1 CRM according to IDC. A scalable, customisable, future-proof platform with built-in AI and automatic upgrades. Enterprise-level security and ongoing support to help you grow. An app ecosystem that means you get more from apps you already use. Discover how Salesforce is committed to your success. Learn how we can help you find, win, and keep customers to grow. Salesforce Small Business CRM can help you grow faster by giving you the tools to fill the sales pipeline through smarter marketing, improved sales productivity and efficiency, and retention capabilities. Salesforce customers report 27% increase in leads, 25% more closed deals, and 36% higher customer satisfaction. You can do it too. Salesforce can help your business streamline and automate processes, so everyone is working more efficiently and consistently. Marketing can use segmentation and email nurturing to attract more prospects and warm them up for sales. Once you have closed those deals, Salesforce Small Business CRM gives your service agents more opportunities to add value and sell more services to your customers. Contact Salesforce to see how a small business CRM can fuel your growth. Small Business CRM: Generate more business with our Contact Manager Edition by Salesforce – the #1 CRM tool on the market. Business Contact Manager: Mobile Customer Service Software from Salesforce Service Cloud. CRM Sales Software: Sales software as a service gives you a complete view of customers and prospects, so you can close more sales, more quickly. How Much Does CRM Cost? Browse hundreds of CRM tools and on-demand CRM applications on the Force.com AppExchange. Top CRM for SMB: Read how Salesforce has been voted as the top CRM solution for small businesses.